I have to confess at the very outset of this review that I am somewhat biased. You see, I absolutely love the artwork on the World Spirit Tarot (WST) deck. The cards are hand-colored linoleum block prints, and from the bold line work that characterizes the block print process to the vivid colors with which the prints are embellished, each card is an exciting visual treat. In fact, just browsing through this deck is like taking a stroll through an art gallery. For example, the vibrant Six of Wands is a work of art in its own right. Having a perspective that originates in the midst of the cheering crowd, it draws us into the scene, inviting us to be a part of the celebration. This type of strong artistic vision typifies this deck and enhances its usefulness as a divinatory tool, especially for those of us who use the card images to facilitate interaction with the querent. But as any collector of Tarot decks knows, nice artwork does not a great Tarot deck make. Like many collectors, I have several beautiful Tarot decks that are filled with images that are, shall we say, divinatory-challenged. For a Tarot deck to work for me, its card images must be meaningfully designed and emotionally and spiritually evocative. Happily, the World Spirit Tarot is all that, and artistically pleasing as well. In addition, this deck’s artistic value serves to enhance the meaning of the cards rather than distract us from seeing that meaning. Even the colors work well with the sense and meaning of the images. A few notable examples of this are the Eight of Cups, with its somber blue and turquoise tones that express “the heart’s yearning for a deeper meaning,” the Moon card, wherein blues and violets enhance the haunting feel of the card, and the Five of Cups, where autumnal colors evoke the wistful feeling of loss that one experiences with the end of summer and the approach of winter. Both art and symbolic meaning mesh wonderfully in this deck in order to create some excitingly innovative versions of the traditional Rider Waite Smith (RWS) images. For example, I love the festive maypole dance on the Four of Wands, the vertiginous view from above on the Tower card, and the “dream catcher” pentacle on the Nine of Pentacles. The Temperance angel seems to be mixing not water, but liquid fire, an excellent representation of both balance and alchemy, which are integral elements of this card’s meaning. The High Priestess appears to be in the midst of performing a mystical rite, and her card has an eerie, dreamlike quality that suits her very well. And the Four of Pentacles shows a relatively complex scene that depicts several figures sharing what they have, as well as a central figure who is “defensively clutching her share.” This is a much richer scene than the one on the RWS Four of Pentacles, and so I find that it more explicitly evokes the wide range of meaning of this card. Another significant feature of the WST deck is its ethnic and cultural diversity, which lends it a more universal appeal. More importantly, though, there is no set pattern to this diversity. It seems completely random, as if the ethnicity of the figures in the cards is totally irrelevant, which, as far as the Tarot is concerned, it truly is. In and of itself, this implies the valuable message that we are all one, and more specifically, it emphasizes the fact that each card can refer to anyone — anyone at all. In general, the WST cards follow the RWS tradition closely enough (in feeling, if not always in detail) so that anyone with a RWS background can hit the ground running with this deck. At the same time, there is a good deal of innovation in this deck, so it can take you on an exciting journey of discovery as you explore the many layers of meaning in its symbolism. For example, the Sage (i.e., King) of Pentacles is, as usual, enthroned in the midst of a lush garden, but in this deck, there is a happy pig lolling at his feet. Today, we tend to see pigs as representing gluttony or slovenliness, but traditionally, they also signify wealth. Thus, this symbol can represent both extremes of this king. A few of the cards, however, take a more notable departure from the RWS tradition. For example, the man on the Two of Wands is standing on a beach at night instead of on a parapet in broad daylight. In this case, the night scene facilitates the inclusion of a shooting star, which implies a good omen under which an enterprise may be initiated. This gives the Two of Wands a new twist that I like. Of the cards that depart from the traditional images, there is only one that has presented me with some difficulty. In the Three of Swords, instead of the familiar thrice-pierced heart, we see a tangled image consisting of a furtive reflection in a cracked mirror and an anguished figure turning away from three daggers “pinning up a proclamation” on a wall. While it is true that the sense of pain and sorrow typically seen in the Three of Swords does come through in this version, these added details sometimes seem to obscure the message. This brings me, then, to my one complaint about this deck and booklet set. O’Leary has grafted a lot of interesting symbolism onto these cards, and it would be nice to see these new elements explained, even briefly, in the accompanying booklet. Unfortunately, though, the booklet generally fails to do so. Certainly, I am up to doing a bit of homework — and the use of a symbolism dictionary has satisfied some of my curiosity — but sometimes I find this deficit of explanation to be an irritating flaw in an otherwise well-written booklet. Fortunately, though, Godino and O’Leary generally make the most of the enforced brevity that is inherent in a small booklet, packing a lot of meaning into a small space. This booklet provides keywords (for the numbered cards only) and short descriptions of the cards. It also provides general discussions of the card meanings that are particularly well written, having a simple elegance that makes them easy to read as well as enlightening. In the past, Tarot decks typically have come with a Little White Book that is usually more cryptic and confusing than helpful or informative. But Llewellyn has started packaging their decks with a more substantial booklet, and if this one is any indication, this change may be one of the best things to happen to Tarot decks since Pamela Colman Smith put pictures on the numbered cards. Finally I have found a booklet accompanying a Tarot deck that has enough valuable insights to enable novice readers to use its deck effectively. All in all, then, the World Spirit Tarot is a beautiful deck with an innovative spirit, a strong voice, and an original artistic vision. It is relatively easy to use, especially for anyone who is already familiar with the RWS tradition, despite a few nontraditional cards that may require a bit of exploratory work to understand well. But the proof is in the pudding, so I will include here a brief reading that I did with this deck when I first got it. I will join with your heart in a loving union, and I will show your heart and soul how to dance together. Divine healing when your spirit is wounded. I am passionate and fierce, so together with your strength and courage, we can run free and hunt for food for your soul. And so united, we can work within a sacred space of great energy. I am here to help you blend (Temperance) your love (Two of Cups) for the Tarot with your passion (Seer of Wands) for your Tarot career — a blending that will reinvigorate, redirect, and purify both. I found this reading to be propitious, a promise that I could work with this deck nicely in a great partnership. This has indeed been the case. The World Spirit Tarot definitely has a voice of its own, which yearns to be heard, and strength and passion of its own, which yearn to be expressed. Yet, although its message has not always been easy to take, this deck has always spoken compassionately, providing difficult insights in ways that I can accept and use. And certainly, it has been a source of both solace and inspiration as I have used it for my daily one-card draw for many months now. I have emphasized in this review that the World Spirit Tarot is beautiful, insightful, and fairly easy to use. However, more important than that, it continually rekindles and renews my love of, and passion for the Tarot. 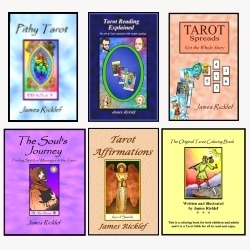 The World Spirit Tarot deck and booklet set. Suits: Wands, Cups, Swords, and Pentacles. Court Cards: Seer (Page), Seeker (Knight), Sibyl (Queen), and Sage (King). Major Arcana: Traditional RWS nomenclature and numbering. The quotes used in this review are from the World Spirit Tarot booklet. See this video in which the creator of this deck discusses the artistic process for the cards in this deck. Note that this video was created for the indigogo campaign to reprint the deck in 2015.